Founded in 1991, Battery Solutions Inc. (“BSI” or the “Company”) is one of the top five leading battery recycling solutions providers that processes more than 100 battery chemistries and serves over 6,000 supplying customers in all 50 states. The Company sorts and processes batteries in its two facilities located in Brighton, Michigan and Mesa, Arizona, before downstreaming materials to over 25 smelters, processors and environmental service companies. Chris Sova founded BSI in 1991 and remained the sole owner for 25 years. Mr. Sova constructed a quality, experienced management team inclusive of his son, Jeremy Sova, and his brother, Johnel Sova. With retirement on the near-term horizon, Mr. Sova sought a recapitalization in order to achieve liquidity and create a transition plan for his exit. We are excited about joining Alston Capital Partners. The strategic alliance between the two organizations is very promising and the entire Battery Solutions team is looking forward to the future growth of the business. GulfStar Group was outstanding during the endeavor and we are grateful for their passion, dedication, and guidance throughout the entire recapitalization process. They provided a tremendous amount of support and their team managed the negotiations with a high level of professionalism, which resulted in a highly successful transaction. With the proliferation of handheld electronics devices and the addition of new battery chemistries over the past decade, the Company constructed a new facility and introduced a new battery processing capability culminating in substantial growth in the past 18 months. The Companies profitability also increased substantially. One of the challenges faced was the necessity to demonstrate future earnings sustainability. Achieving value for this growth and a good partner for his employees were important objectives of Mr. Sova. BSI enlisted the help of GulfStar to take the company to market. GulfStar received numerous indications of interest, uncovering multiple alternatives for the Company to consider. 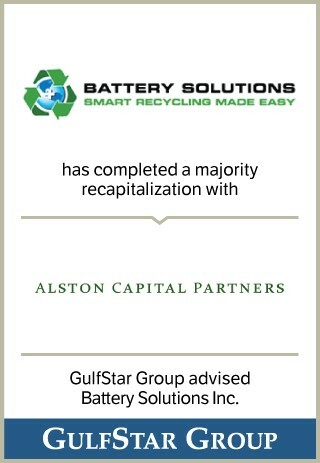 Ultimately, the deal was closed with Alston Capital Partners, a private equity group that had meaningful experience in the recycling sector and whose partnership would help to further enhance the Company’s future in the battery recycling market. Working with the Company, GulfStar was able to demonstrate the recent increase in cash flow was sustainable. Mr. Sova achieved his transactional goals and equity incentive programs were created for the key managers who continue to operate the business.